I began drawing at a very early age. In the early seventies my high school art teacher , Louis Penfield , took on the role as my art mentor. We spent many hours collecting material for massive found art sculptures made of metal. We would draw and paint from life, in class, after school and on weekends at his estate designed by Frank Lloyd Wright . Wright also designed an art studio for Lou that was never finished . We hauled stone from the Chagrin river in northeast Ohio flowing through the property and worked on the studio. Then we would set up still life compositions and paint in watercolor. After a stint in the US Navy I moved to Washington and started studying for architectural engineering. While attending Olympic college I began taking art courses and made the decision to focus on my art. At the time I was working in watercolor and started taking workshops from successful local artists. Deanne Lemley, and Jane Wallace were among them. In 2006 , I joined the daily painters movement after reading about Duane Keiser and Julian Merrow Smith. I was desperate for more motivation to produce art and while I never actually achieved daily painter status , that is, completing a painting every day for an extended period of time, it was a good move for me to get involved with dedicated artists online. This resulted in a vast improvement in the quality of my artwork and I am now very thankful to be a full time artist. Now working in oil I continue learning as much as I can from other professionals in the field. I have attended workshops with Darrell Anderson, Jim Lamb, Ned Mueller and others. 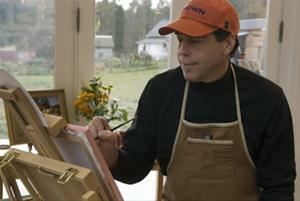 I am currently painting and teaching at The Knowles Studio in Poulsbo WA. alongside printmaker and art instructor , Leigh Knowles Metteer. My paintings are represented by The Directors Gallery on Bainbridge Island and Alki Arts gallery in West Seattle. I have work published in, City Living; The Longborough Festival Opera, UK; Daily Painters, Color, Obsession and Joy; and others. I have sold hundreds of paintings from my blog site and have work in private and corporate collections worldwide.